Over 7000 newspapers from around the world! Read your favourite newspapers online anywhere with PressReader! Full-issue, full-colour newspapers are made available online on publication day, and most titles include back issues. Over 7000 newspapers & magazines in more than 60 languages can be viewed on computers, tablets, and smartphones. Accessing from home will require an active library membership card, while anyone can use the service at our 15 library branches. PressReader works great in most web browsers, though mobile device users have the option to download and use the PressReader app from either Apple's App Store or from Android's Google Play Store. 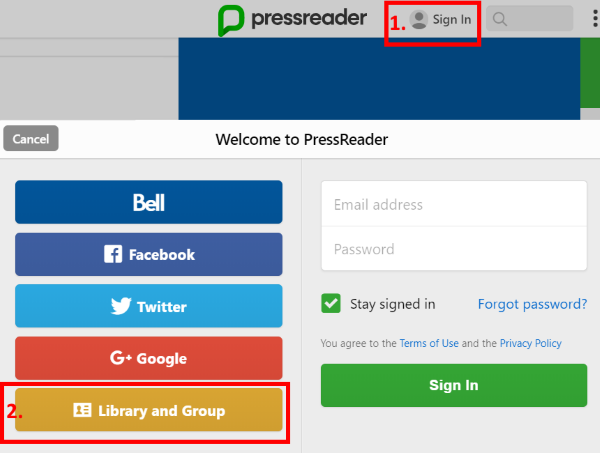 Note that some titles may only be available while accessing PressReader directly from a library branch (ex: The Globe & Mail), but most publications are available from home or on the go. Click the "Sign In" button near the top-right of the screen. Click the "Library and Group" button. 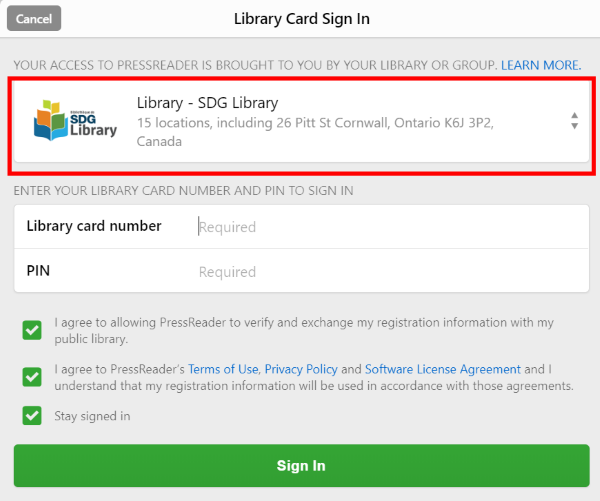 Select or search for "SDG Library" from the list. Enter your full library barcode (no spaces). Enter your library PIN. Your PIN is usually the last four digits of your phone number. You may be asked to register your name & email address for the first time only. Begin searching for newspapers and magazines using the search bar in the top-right corner, or browsing titles and accessing other functions by clicking the three horizontal lines at the top-left of the screen. Alternatively, you can access the older Library Press Display here.